Nestling amongst the trees on the side of Deacon Hill with sweeping views westward down the valley towards Winchester and the Cathedral, the Church remains little altered from the days of William the Conqueror. Few Churches can rival its setting and there is a moving beauty in its very simplicity. 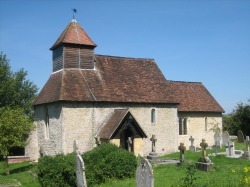 Most authorities agree that there was a Church at Chilcomb before the Conquest of 1066. The architecture of the present church is early Norman with distinct traces of Saxon influence, notably in the height in proportion to the width. The Chancel Arch is ornamented with rough dog tooth outline which suggests the work of Saxon craftsmen under the instruction of a Norman priest. There are two bells, one dated 1380 the second 1628. The church plate dates from 1589, an Elizabethan Chalice and 1680, a silver Paten. These can be seen in Winchester Cathedral Treasury. Above the Chancel arch hangs a simple crucifix made from driftwood and inlayed with bronze and gilded made by Peter Eugene Ball regarded as one of the leading contemporary religious sculptors. We hope you may come and visit to either just sit and be still and offer up a prayer. The Association of the Friends of St Andrew’s was formed in 1961 when the future of the Church was in question and under threat of closure. Since then the Friends together with our many visitors from far and wide, help financially to maintain this very special place and its surroundings. If you would like to become a Friend of St Andrew’s, a Membership Request may be downloaded below. If you are a Tax payer and are able and willing to Gift Aid your Membership fee and any other donations (which help us to reclaim tax) please complete the Gift Aid Declaration, which also may be downloaded below, and send it with the Membership Request. There is a annual Gathering of the Friends each June to which you are cordially invited. Details can be requested from the Secretary whose details can be found on the Membership Request.